This is your Coaches Lacrosse Wipeboard in the simplist of forms. During a timeout, all you have time for is a quick sketch - you don't have time to run automatic plays like some of the other Apps. In order to use the Lacrosse App effectively, all you need to do is place your finger on the screen and draw - similar to using your finger as a pencil. As soon as you do this, you will notice that your have created coloured lines - you can now create anything with your finger, from lines, circles to crosses. 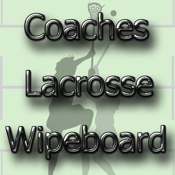 To clear the Lacrosse Wipeboard, just Triple Tap the screen you are ready to start a new game play.